I put together this quilt top and have debated on whether to quilt it or tack it. I am worried the blue jean blocks will be too thick. What do you think? My vote is for quilting this pretty quilt.. but I would choose a nice large pattern and not quilt too close together.. I have quilted on denim...just be sure to use a denim needle...I used a 14 but you could also use a 16 if your denim is really thick. If you just do something simple like diagonals across your blocks it will work great. Don't try to do any dense quilting on the denim. 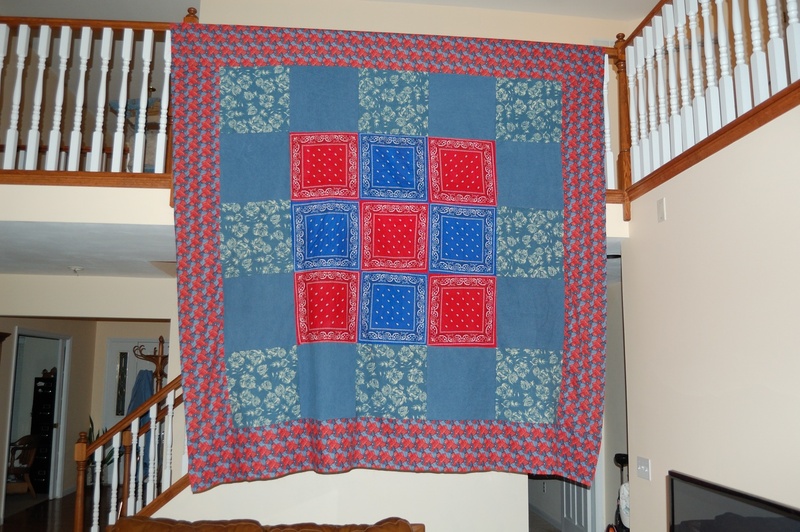 If you want to do more quilting on the bandanas that might make a lovely contrast to the minimal quilting on the denim. Oh! Just had another thought. A simple medium sized heart in the center of each denim square would be lovely. I like Mom-6's suggestions. That's a sweet quilt. I prefer quilting rather than tying. Like the others said a simple design would look really nice.